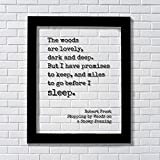 A review of the life of Robert Frost, as compared to the poem "Stopping by Woods on a Snowy Evening," previously submitted for a class in English Literature. Stopping by Woods on a Snowy Evening catches the attention of its readers on many levels. Robert Frost’s beautiful writing in itself is indeed mystical in the way it transforms your surroundings and paints the perfect picture. The reader can feel the stillness of the air, hear the softness of the snowfall and the slight jingle of the bells on the horse’s reigns. When one digs deeper into the meaning and soft metaphors one may find this poem speaks to their soul on a whole different level. Stopping by Woods on a Snowy Evening is more than just peaceful words, it encroaches on what is arguably the true meaning of life and speaks of achieving your goals while remembering to stop and smell the roses along life’s great journey. Left to care for his family at a young age, Robert Frost’s life was plagued with sadness. His father died when he was a young boy; his mother suffered from depression and died of cancer before he was thirty, and his sister was committed to a mental institution where she died after nine years. Frost married and had six children, only two of which outlived their father. One died at birth, another died just days after birth, a son died at age eight, and one daughter committed suicide. Though he never actually graduated from college, Frost was a teacher for over forty years, received four Pulitzer Prizes for his poetry, and received dozens of honorary degrees from Ivy League schools. When he died in 1963 at the age of 88, his epitaph quoted a line from one of his poems: "I had a lover's quarrel with the world" (http://gonewengland.about.com/library/bloldchurch.htm). Like his mother, Frost suffered from chronic depression, evident by the presence of death in many of his writings. 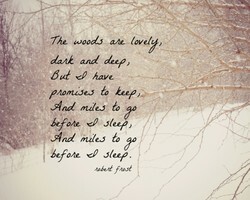 The journey of life and death is very apparent in Stopping by Woods on a Snowy Evening. The traveler knows he is not at his final destination, yet he stops with his companion, the horse, to have a look around. “He gives his harness bells a shake\ To ask if there is some mistake” (Frost, Ln 9-10). The horse knows they are not where they should be, yet the traveler cannot resist marveling in the falling snow, enjoying life’s little pleasures. “He will not see me stopping here\ To watch his woods fill up with snow” (Frost, Ln 3-4). “The darkest evening of the year” (Frost, Ln 8), describes it being later in the traveler’s life as he is no longer a young man. “Sleep” (Ln 15), is a metaphor for death. The traveler seems very aware that he has not yet fulfilled his worldly responsibilities. The traveler is very at ease with where he is in life, as if he has accepted that his time is ending soon, or even that he may be contemplating taking his own life after he finishes a few more things. “But I have promises to keep, And miles to go before I sleep, And miles to go before I sleep” (Ln 14-16). Repeating that last line makes it seem so confirmed and final. There is no question that it is the end, both of the poem and of the journey Frost writes about in the poem. 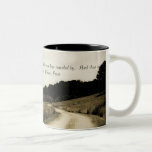 Like Robert Frost, other authors have spoken of life as a journey. Some say this allusion pays tribute to Dante Alighieri in the Inferno when he wrote, “In the middle of the journey of our life I came to myself within a dark wood” (http://tinablue.homestead.com/literaryallusion.html). The similarities are apparent. Both Frost and Dante write of the journey of life and death, and of course the “dark wood.” Whether Frost intended to mimic Dante Alighieri no one knows. It is likely that a scholarly man such as Robert Frost was well versed in Dante’s work, and perhaps was inspired by him or could relate to his darkened words due to his ongoing states of depression. 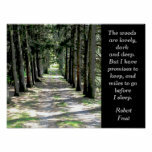 Was Robert Frost’s intention to define life as a whole? Was he referring to death and all the tasks one must accomplish before passing through those pearly gates? Or was he simply writing about stopping to take in a beautiful winter scene? Whether it was Frost’s goal to reach his readers on such a deep and spiritual level we may never know. His subtle yet profound messages inspire so many of us. His simple works make it easy to find peace while reading them and be entranced by his words, just as the traveler was entranced, “The only other sound’s the sweep\ Of easy wind and downy flake” (Ln 11-12). As the traveler stops to reflect on the beautiful snowy scene, or perhaps to reflect on some distant memory before he embarks on the next chapter in his life, the readers are also asked to stop and reflect on their own lives as well. For we too, “have promises to keep, And miles to go before we sleep, And miles to go before we sleep” (Ln 14-16). Don't see exactly what you want? I welcome custom orders! Deciding to self publish a children's book may seem simple, but there are many things you must consider. Here is how I self published my children's book and why I made that choice.